Playing appropriate movie clip during presentation is a great way to convey your idea/thoughts to audience. 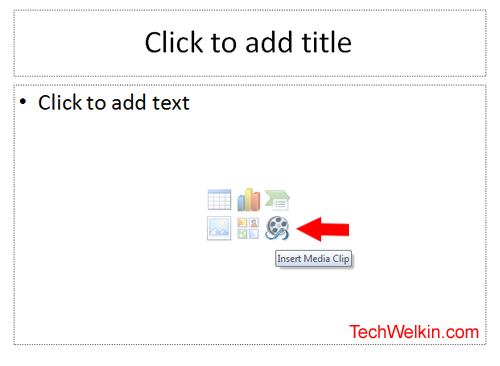 Learn how to insert/embed a movie or video clip on PowerPoint presentation slide. To deliver a power packed presentation that can spellbind your audience –you need to use just the right kind of effect on each slide. If a picture says a thousand words –a video can say perhaps a million! Therefore, sometimes it is a great to embed a video in your PowerPoint presentation to put your idea across with an impact. A file selection box will popup. From this box select the movie file you want to embed. A movie placeholder will be inserted on your slide and another box will popup to ask you if you want movie to play automatically or on a mouse click. Select the option as you need. If you choose automatic mode –movie will begin to play as soon as you will come on the slide during slide show. If you choose to play on mouse click –you’ll have to make a click on movie placeholder during slide show. You can resize movie placeholder by dragging it from corners. This way you can create space for other content (like text) on the same slide. You can also add an animation clip on your slide from a movie clip repository called “Movie Clip Organizer”. This is a gallery of simple animation clips provided by Microsoft. If you find a particular animation suitable for your slide’s purpose –you can select and embed it from the same menu. Shortcut to insert a media file in a slide. NOTE: There is a shortcut to this process. As shown in the above image, when you insert a new slide, you get a few options in the center of the default layout slide. You can embed a movie clip by clicking on the “Insert movie clip” option in there as well. Please let me know if you have any questions in this regard. Thank you for using TechWelkin! video that i added has become a shortcut in pendrive and is not working at any other pc so now what can i do?? ?